Welcome to my August 2012 Monthly Income Report! This post is special because it’s the first post I’ve published on SPI since becoming a father of two! Our baby daughter was born last week, a couple weeks early, but she and mommy are doing very well. Thank you all for the best wishes and support! I’m remembering what it’s like to sleep no longer than 2 hours at a time, but I absolutely love it. Here’s a picture of our daughter on Facebook—isn’t she gorgeous? All right—let’s get to business. Each month I write a detailed report about my online businesses – what I’ve been up to, what’s working, what’s not, and how much and where my income is coming from. I create these reports for several reasons. First, they are here to help me keep track of how I’m progressing – sort of like an online journal that I can go back to in the future. Secondly, I want to be transparent about everything I do online. I talk a lot about online business strategies that I use and this is where I summarize whether those things work or not. I share so you can learn from my wins, as well as from my losses too. Lastly, I share the numbers in this post only because I know you’re interested and they inspire. I don’t do this to showoff or pretend like I’m better than anybody else, because I’m not. I just take action and execute, and these are my results. A lot of “prep-work” is being done in several of my businesses for the future. Here’s what I’ve been up to. It’s been a long time since my business partner and I published a new iPhone application, but we’re working on a new one as we speak. We just hired a developer to execute an idea we’ve had for over a year that we’re finally acting on. The total cost will be a few thousand dollars and it’ll be interesting to see how it’s received by the market. As many of you know, the iPhone app market is extremely saturated now and releasing a new application in this environment is very ‘hit or miss’—mostly miss—but we see that as even more reason to make sure the application is unique and something noteworthy, which we believe it is. If I had to go into the iPhone app market again from scratch, I wouldn’t choose the path that we chose , which is the “lets build an entertainment brand that builds apps that serves no specific market except those that are bored or looking for a good laugh”. I’d rather follow Mike Doonan’s model and build an application that provides a solution to a specific niche or a specific pain. Very similar to Dane Maxwell’s approach to software as a service. We’re excited through, and we will be thinking outside of the box when marketing this application so it does serve a specific market—sort of. I’ll tell you more about it once it’s almost ready to go. It’s not an easy application to develop either, so we’re not exactly sure how long it’ll take. A couple months at most, I’m hoping. We’ll see, but it’s nice to get back on the saddle. For the past month, I’ve been working on redesigning the niche website that has so far earned over $30,000.00 since it was born out of the Niche Site Duel. I’m working towards expanding its income sources outside of Adsense, which currently make up about 98% of the total income. It’s definitely not diversified, which isn’t smart. I tried a couple of other income sources on the site before. Private advertising worked (i.e. cutting out the middle-man: Google), but the few hundred I was earning per month from those direct advertisements did not make up for the several more hundred that I lost in Adsense as a result of putting those direct ads on the site, so I decided to ditch the private ads. I also tried CPA (cost-per-acquisition) offers that I found on sites like Commission Junction, but the only relevant offers were for Criminal Justice degrees and after several thousand impressions and ZERO conversions (and hardly any clicks), it was apparent that people on my security guard training site were not looking to find criminal justice degrees, which makes complete sense. They are there because they want information on how and where to become security guards. I was already giving them the how with my content, but I wasn’t actually giving any information as far as the “where” to get training, so that’s what I’ve been working on these past couple of months. One of my VAs has been conducting research for me and has compiled a nice database of about 2,500 (and growing) security guard training companies around the United States—a list that apparently has never existed before on the web. My other VA has connected this database to a Zip Code search function on my test site through MyPHPAdmin. Now, anyone can search for their zip code and find a training facility near their area. 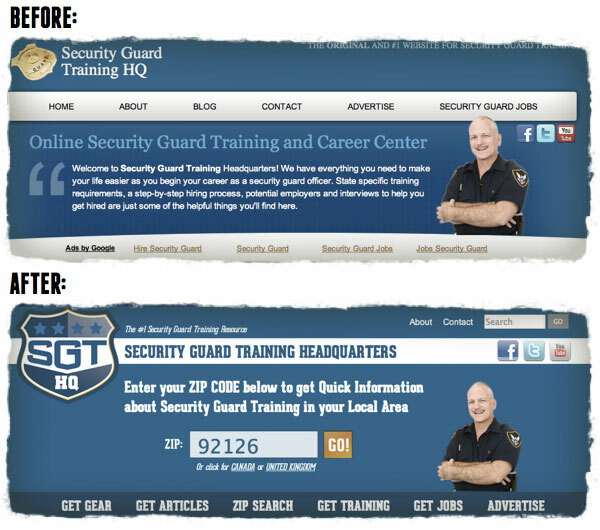 When the new site goes live, the homepage will include a clear call to action in the header to enter a zip code. From there, the results page will show a list of posts related that that specific state (since each state has a different set of security guard training requirements) and the nearby training facilities below that. On individual internal posts, which is what a majority of my traffic lands on first through Google, at the bottom of the post I’ll include a zip search function box/action-area as well so that when people finish reading the requirements, they’ll get the nearby facilities in their area as well. So, how am I going to make money with the Zip Code search function? My thinking is that it’s going to be very similar to the 1-800-DENTIST business model where people come to the site, find a company close to them and give me their contact information. I can then send that information (individually or in bulk) to the particular security guard training company for a fee. I’m not 100% sure how this is going to work yet, it’ll take some trial and error and experimentation, but all I know is that there are security guard training companies in need of leads and people who are desperately looking for security guard training companies in their area (that’s my #1 email I get) and I’m providing the solution for that. I will probably have to hire someone part time to execute this for me and forward the leads to various companies. We’ll see what happens, and even if it doesn’t monetize it’ll be an important feature on the site that’ll definitely make it stand out and become a top resource in the niche, which can only help my Adsense income. It should up the traffic coming to the site as well. I’m also going to be partnering with a security guard gear company to sell gear on my site too, and I’ve also noticed that security companies around the web have terrible looking websites. It might be cool to start to offering specialized design services for them as well, maybe an out of the box solution I can create that’s specific for this niche (again, a la Dane Maxwell). I could probably charge a good amount for this as well. How to Grow a Blog and Following with Podcasting on Social Media Examiner. An entire chapter in Steve Olsher’s recently published book, Internet Prophets. How Content Can Help You Grow a Loyal Following on Social Media Examiner, again! 10 Leaders Who Aren’t Afraid to be Transparent on Forbes! The Forbes article was an awesome surprise and I’m deeply humbled to be listed in a post with other business leaders who I definitely look up to, such as Tony Hsieh from Zappos and Jason Fried from 37Signals. It’s also pretty cool to represent the solopreneurs and work-at-homers out there since I’m the only one of the list. Also, if you watch the reality show Big Brother on CBS, there’s a man named Dan Gheesling who actually won Big Brother in 2008 who is back on the show this season. After he won I helped him with his business a little and I found out that he’s been name dropping me and my blog quite a bit on the live feed. Talk about Being Everywhere! Speaking of “Be Everywhere”, the biggest project I’ve been working on as of late is my book. I’m currently over halfway finished (over 25,000 words) and am already working with an editor to go over the parts of the book I’ve already drafted. I’m enjoying the process very much, as much as it is stressful and new for me. I can crank out a 3000 word blog post in just a few hours, but this book is an entirely new beast. Since I’ve started, I’ve learned to stop editing along the way and just let the words flow, and a lot of great stuff has come out of it. I can’t wait to share it with you! If you’re not yet following my progress and the progress of several other published and soon-to-be-published authors, click here to join the private Facebook group which is now over 2,600 people strong! And it’s very active too! I’m learning new things every day. Another amazing month of earnings! The Bluehost earnings continue to amaze me and the conversion patterns have always been the same. If you’d like to learn more about exactly where my Bluehost links are located on this blog, and how well each of them convert, click here. As I mention in every income report, I’ll be the first to admit that a significant portion of my total online income comes as a result of The Smart Passive Income Blog – mostly from the products that I recommend as an affiliate, which are products I’ve used or am extremely familiar with and have helped me in one way, shape or form. Because of that, I have no shame in earning this much from the blog as I know that I’m helping people, I’m just fortunate that I’m doing it in a way that pays me back too. My non-SPI related income is over $10k per month (which I’d be completely happy with and is much more than I ever made working my 9 to 5 job in architecture) but I’m truly blessed I have the support of an amazing community here at SPI who is willing to pay me back for all of the information I publish here and the help that I try to provide. Some people go out of their way to make sure I get credit for an affiliate link, often emailing me to make sure I got it, which means the world to me. Thank you so much! I’m going to keep this short because I’ve been writing for a few hours (not straight away), sometimes typing with just my right hand with a sleeping baby cradled in the other (like I’m doing right now). There is one thing that all businesses and blogs should strive for, and it’s not more traffic, subscribers, leads, conversions or sales. 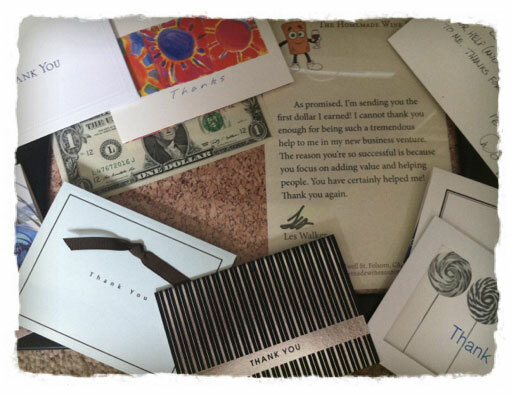 This is actually a picture of just a small percentage of personal thank you notes that have been sent to me, many of which are hand-written from people who have benefited from the content that I’ve produced on this blog. People who have seen results. The more thank yous that you can get, the more traffic, subscribers, leads, conversions and sales will come your way. Whether it’s through comments, email, social media or personal notes from people like these, or even word of mouth, getting “thank you’s” is a great way to know that you’re doing something right, because remember—it’s people who are on the other end of traffic, subscribers, leads, conversions and sales. Thank you all for your support, and have an awesome September!